The last known love letter Charlotte Bronte wrote to her ‘master’, the man she fell madly in love with in her early twenties, her Belgian professor, Constantin Héger, was written on 18th November 1845, exactly 169 years ago, tomorrow. What do we know of the love life of the woman who penned one of the greatest love stories ever written? In spite of her numerous letters, and the biographies written by her contemporaries, there is still a great deal of controversy. Was she a nun-like, prudish bore, or was she a passionate, romantic lover? Tanya Gold, reminds us in an article in the Guardian that her contemporary biographer, prim Mrs. Gaskell, wanted us to believe Charlotte was a dull and saintly, so she intentionally left out certain significant aspects of her love life, even suggesting that her well-known infatuation with Heger was imagined. Who was Heger, and how did they meet? In February, 1842 Charlotte and Emily, accompanied by their father, travelled to the Pensionnat Heger, in Brussels to complete their studies. Their aim was to improve their skills in languages. In return for board and tuition, Charlotte taught English and Emily taught music. Their stay was interrupted in 1843, due to the death of her aunt, Elizabeth Branwell. After a short trip to Haworth, Charlotte returned alone to Brussels, where she remained until January, 1844. On her return to Haworth, and for almost two years, she exchanged passionate letters with her professor and mentor, M. Héger. 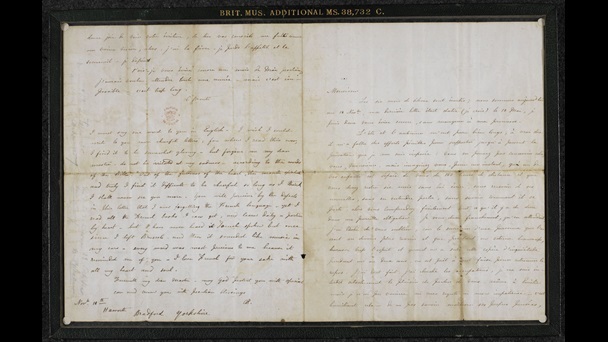 Four of these letters have been recovered and are kept in the British Library. Although Mrs. Gaskell had personally visited M. Heger while she was writing Charlotte’s biography, and was shown the letters, she decided not to include them, or their relationship, in her biography. This was probably due to various reasons. Firstly because Charlotte’s father and husband were still alive. Secondly, because the Victorians, and Mrs. Gaskell herself, did not want the memory of their admired novelist to be tainted, by revealing that she had been shamelessly in love with a married man. In 1912, M. Heger’s son, Paul Heger (1846-1925), who had never met Charlotte Bronte, because he was born two years after she left Brussels, presented the British Library with four letters sent by Charlotte Brontë to his father between 1843 and 1845, and they were shortly after printed in The Times newspaper, causing a literary scandal. We do not know Héger’s reaction to her letters, because although she refers to his replies in her letters, the former have been lost, and the only remaining accounts are those put forward by Mrs. Heger, M Heger’s wife, the mother of his six children, and his employer, for she was the owner of the Pensionnat where he worked. According to his wife’s reports, she herself kept the letters, which her husband had torn, sewed them and preserved them for posterity. In spite of being the accepted version, it sounds at the very least improbable that she would bother to recover and keep the ardent letters a young English student fervently (and probably annoyingly, for her) sent her husband. 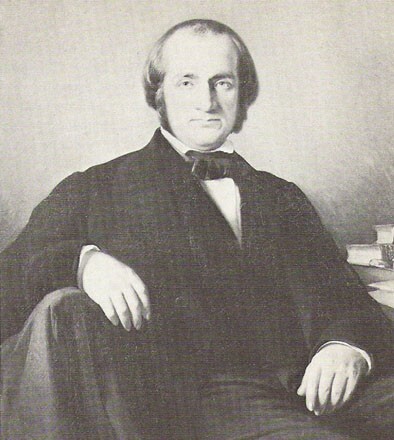 Bronte scholar, Brian Bracken’s article published in Janaury 2013, challenges traditional assumptions, based on Marion Spielmann’s article (1919), ‘The Inner History of the Brontë-Heger Letters’, which suggested that it was M. Heger who tore the letters, while his wife repaired and preserved them. Spielmann had no doubt also found it difficult to accept that Charlotte Brontë had fallen in love with a married man and had written passionate letters to him. There is no proof either way, but I am not the only person to suspect that it was Heger who repaired the letters his wife had found and torn, kept them, and aware of their literary value, gave them to his sons on his deathbed to be made known in England. He is professor of Rhetoric a man of power as to mind but very choleric and irritable in temperament—a little, black, ugly being with a face that varies in expression, sometimes he borrows the lineaments of an insane Tom-cat—sometimes those of a delirious Hyena—occasionally—but very seldom he discards these perilous attractions and assumes an air not above a hundred degrees removed from what you would call mild & gentleman-like he is very angry with me just at present because I have written a translation which he chose to stigmatize as peu correct. Charlotte would later fall in love with his ‘Byronic’ character and refer to him as ‘master’, in her letters. How far their relationship went, or to what extent it was reciprocal, is also unknown. In Jane Eyre, a frail, petite, pale, and plain governess, much like Charlotte herself, fell in love with the unattractive, temperamental, and choleric Rochester, except in this case it was reciprocal, and Rochester was rich enough to do as he pleased. Rochester was also married, but he had no legitimate children, and his mad wife conveniently committed suicide, so her fantasy was complete, including a happy fictional ending. Farewell, my dear Master __ may God protect you with special care and crown you with peculiar blessings. Brontë’s publisher, George Smith, commissioned this portrait of the novelist from George Richmond (1809-1896), as a gift for her father. 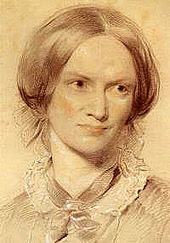 In any case, although Charlotte Bronte, was reportedly tiny, frail, and shy, she was no ugly, unwanted spinster; she received and rejected four marriage proposals between 1839 and 1853. She finally married a man she did not love, but who offered her the financial, and perhaps emotional security, she lacked. Their home was only theirs as long as her father, Patrick Bronte was the pastor at Hawthorne, on his death Charlotte would have been homeless. Mr. Bronte’s original opposition to Mr. Nicholls gradually weakened, and Charlotte and Nicholls became engaged. He became curate at Haworth, and they were married. She died eight months later. Charlotte was pregnant, and it is presumed that she died of severe dehydration and malnutrition due to hyperemesis gravidarum (sever morning sickness). There is still a great deal to read, reread, and discover about the author of Jane Eyre. Margaret Smith has edited an invaluable selection of letters written by Charlotte Brontë from her schooldays to her death in 1855, with many useful notes, giving us some insight into her priveleged and passionate mind. Fascinating post, Luccia. I am currently reading a biography of Jane Digby called The Scandalous Life, and it clearly shows that much correspondence between men a women was flowery and also consisted of poetry. It might be a nice topic to explore. How sad that we no longer correspond by snail mail, but then I couldn’t stand the waiting! Fascinating piece of literary detection.